I must be doing something wrong. My cars are an expense. I have always considered cars and expense-ive investment. Yeah, me too. Depreciating asses are rarely considered investments. Although I guess you could look at it as a very poorly performing investment. After watching my 401k over the last 6 months... at least my Solstice makes me smile! sirwm, JohnWR and Cmccomb1 like this. 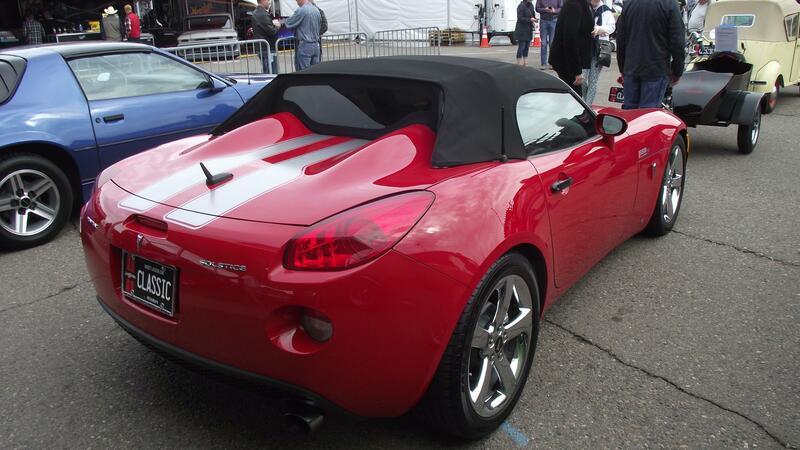 I still think it is beautiful car...too bad they stopped making these cars. I bought my 2006...ordered it with few extras...best thing I ever done...even though I only have 34,000 miles on it...I have never encountered a problem...hopefully that will continue...will keep this car...enjoyable to drive...especially during the summertime. sirwm, Sting Ya and easyryderca like this. All Mecum auctions are available to watch on Youtube, you just have to know the lot number and correspond it to the correct day. 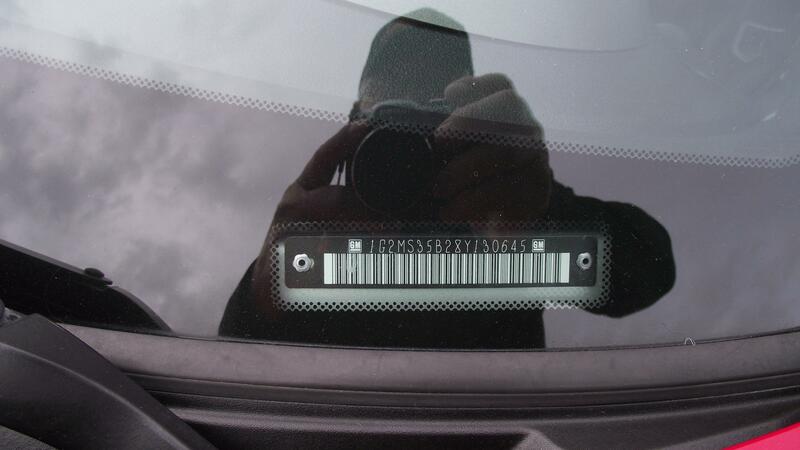 For example the first above listing was lot number J32, which corresponds to Friday, Jan 4, car number 32 of the day. 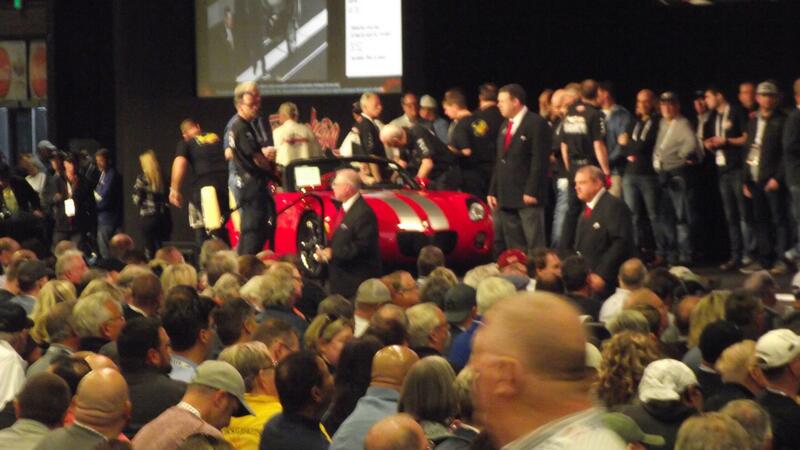 Search YT for Mecum Collector Car Auction - Kissimmee 2019 Day 2. Then fast forward to car 32, it's a little tricky to get to the correct car due to the length of the video, but with some practice you can get very close. Mecum auctions for me are more realistic than Barrett Jackson as far as a cars worth goes .I follow these things to some degree and have been noticing a few Barrett Jackson cars sold the last few years popping up at other auctions lately and the owners taking a substantial hit granted these are higher end cars but I think that because it's a " Barrett Jackson " people tend to overpay because they think it's something special . A lot of these cars that are sold on the first few days of an auction are picked up by dealers or people looking for a bargain . I've been to a few of these auctions both Mecum and Jackson and I can tell you from personal experience that a lot of these cars look better on television than in person . 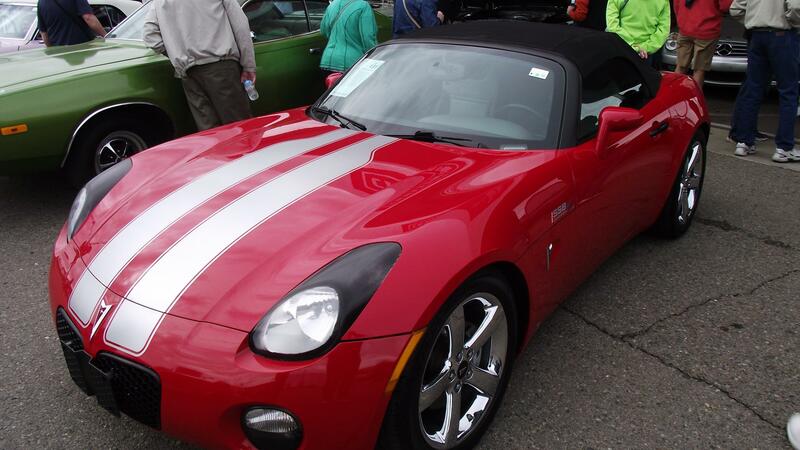 As for the Solstice it appears to be a nice car with decent miles ,nice color combination and some obvious upgrades the SCCA package ,blacked out windshield trim , supercharger and lowering springs / coilovers etc. It would be a good buy for someone if they could get it for 10 grand or under my guess it's going to go in the 6 to 8 grand range unless there is a bidding war .The only problem I have is not knowing the owner history which for me is very important especially in light of the fact that it's a no reserve auction which means the owner just wants to dump it and chances are he or she had the car for sale and could not sell it . Sting Ya, I agree that many cars on auctions are with some kind of major trouble. Very often the reason they're being sold at the auction. A year ago I was a volunteer driver at a local auction and I can attest to that was certainly the case with many of the cars that I drove across the block. I chose not to volunteer again. Your point about not knowing the history of the car and talking with the owner is spot on. A friend of mine recently bought a car sight unseen and had it shipped to him after only a discussion with the seller. The seller repeatedly used the word 'pristine' in the discussion. My friend is not happy, but no one to blame. But in reality, he did not pay a pristine price. The part about the 'no reserve' auction is probably true as far as the seller is concerned. But, I believe Barrett-Jackson just believes they are a 'cut' above other auctions and people will still come to them in spite of the competition. Barrett-Jackson believes people will accept them over others, and they want to earn a commission on every called auction. I'm hearing the auction next week has no open spots left at B-J. And they are selling cars starting Monday thru Sunday. They used to only start selling cars on Wednesday. 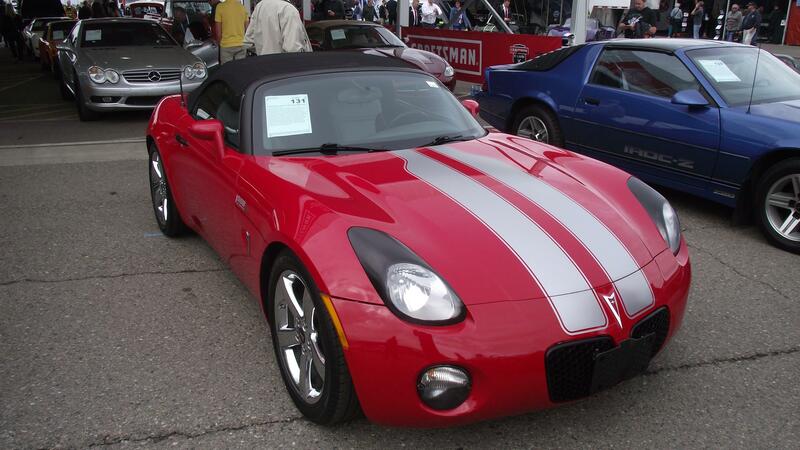 The 2008 Solstice sold at a good price. $12,000 plus fees. At 51K miles it was not exactly pristine, but with a Super Charger installed (if it is trouble free???) it might well be worth what it brought. I didn't get to see the engine, but the drivers seat had one small tear, the top was not in very good shape, and a new set of rubber will be in order right away. The seller should be pleased. Here are some more photos when it was in the staging line. Sky thanks for the update I turned on the tube to see if I could follow this and they started with car lot 150 . At $12000.00 the seller made out especially given the issues you described . I have to believe there was some serious bidding going on with the price reaching that point maybe this is a good sign for anyone interested in selling theirs,are we seeing a market again for these cars ? only time will tell . 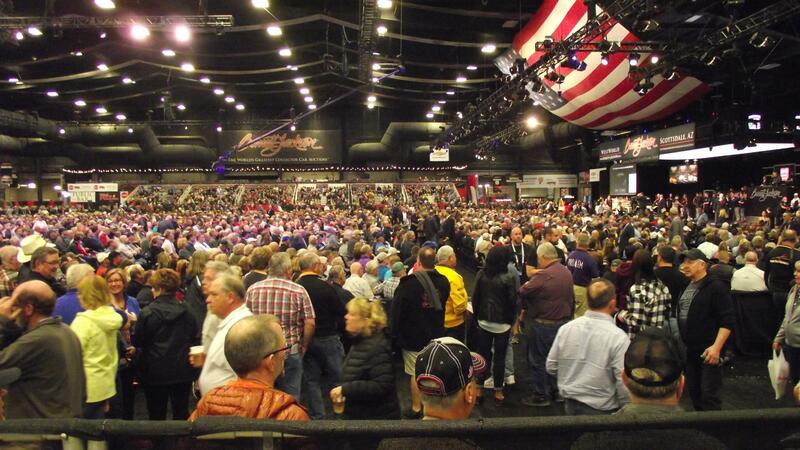 To add another photo, here is a look at the size of the auction attendance. This photo was taken just as the auction began and the Solstice was the 10th item on the agenda. The second photo is the introduction of the bidder tracking staff (they probably have a formal title) that is distributed among the large group of pre-authorized bidders sitting closest to the stage. 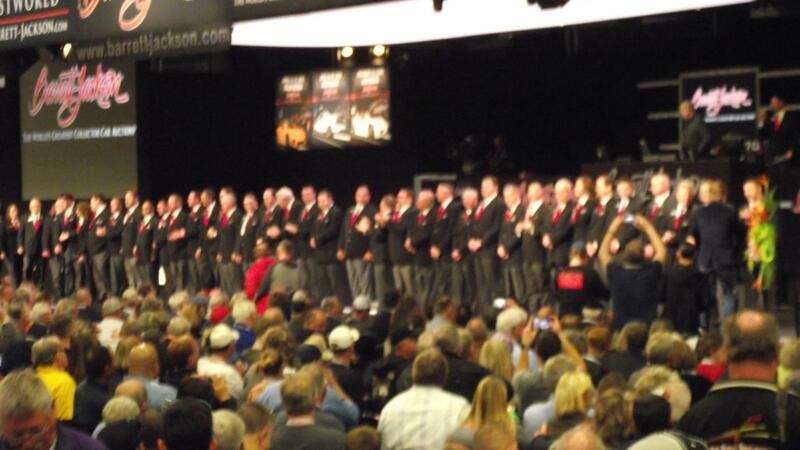 There must have been 50 people in that photo, all identically dressed for easy identification by bidders. Don't forget that the seller is also charged a fee by B-J which is deducted from the sale price, as well as a couple of fees. I haven't looked recently, and can't remember, but 8% sticks in my head. Dave your right 8% plus a listing fee which is based on the location of the aution .The seller ended up paying paying $13200.00 for the car plus taxes and if he needs to ship it that cost needs to be factored in . OK, so a hypothetical Solstice is hammered at, say, $10,000. 2. Seller gets $10,000 less $800 (8%) less a fee based on auction site, date and time. 3. 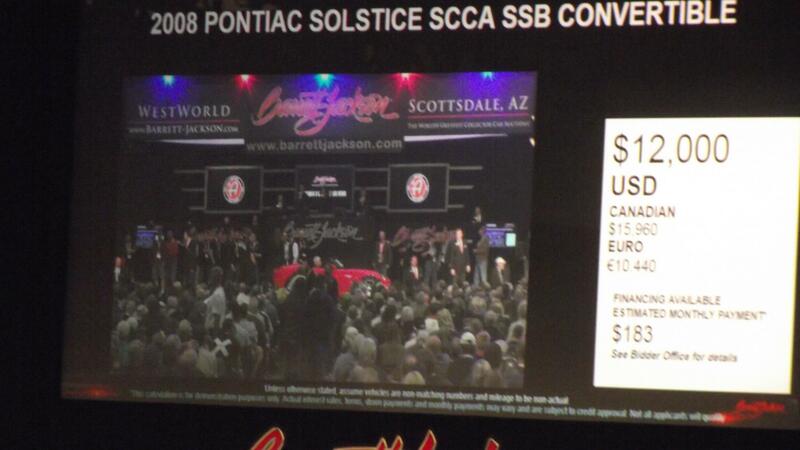 Barrett-Jackson retains $1800 plus the seller's fee. Am I missing anything? 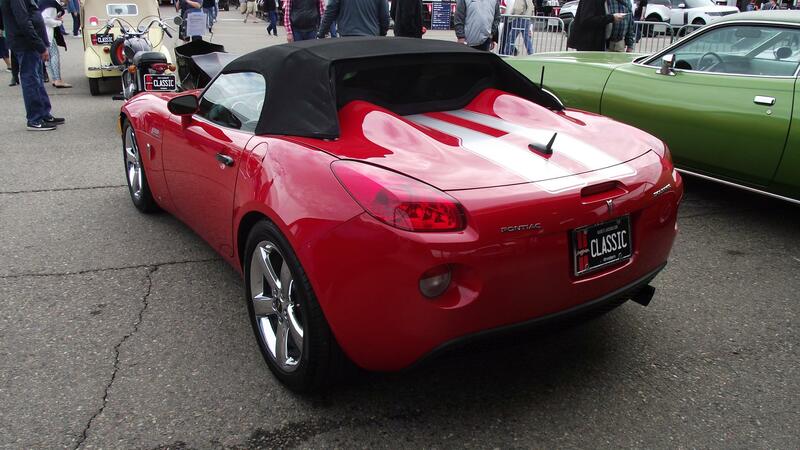 It's getting hard to find these things on the Barrett-Jackson Site.